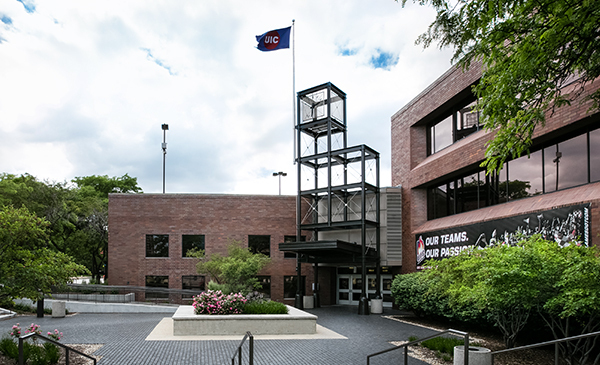 This multi-purpose facility houses several campus services and is located across from the UIC Pavilion on the East Campus. Housed in this space are three conference rooms available for use by campus departments as well as external organizations. These rooms are located at the east end of the main floor and feature an east facing, 20ft. window wall affording views of the Chicago Skyline. Best suited for large group meetings, the space is multi-functional with each room equipped with its own audio and visual components. The versatile rooms can accommodate lecture of 300 or dinners for 200 guests. Large air-walls allow the space to be divided into three separate rooms each allowing enough space for various conference settings.